Kare Kare has recently undergone an extensive refurbishment to reincarnate itself into this beautifully decorated, elegant restaurant with comfortable surrounding and still offering the best of Indian cuisine. Kare Kare has indeed established itself a reputation for serving up exquisite Indian/Asian food. This sophisticated restaurant provides the perfect backdrop for award winning cuisine. 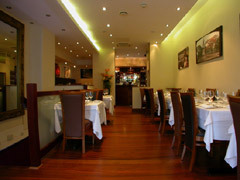 Very light and airy but with a cosy and intimate atmosphere. The restaurant has adopted a modern, fresh approach which is reflected in both its dishes and the décor. Service is friendly and attentive. On a different note all Art lovers will be happy to learn that Kare Kare sometimes plays host to original art and photographic exhibitions. The downstairs lounge and dining areas are available for hire. Both floors can be booked individually or together, and are used for both private and corporate events, including product launches. The staff will work with you to create the perfect menu and entertainment to your requirements. The restaurant can also cater for parties at your home supplying everything from the food to trained staff, cutlery and crockery. They will also set up and clear up. Your choice of Chicken, Lamb or vegetarian curry. The fresh, delicate food is a sensational mix of both traditional and contemporary cuisine with a wine list that is a very good match for the menu. Many dishes are instantly recognisable with a few innovative one�s perfect for the adventurous diner. If my prolebm was a Death Star, this article is a photon torpedo.